Leaving the tents, camp stoves and thermals behind, I set of for a week of pure relaxation. I headed out to Bodrum in Turkey and onto a 100ft wooden yacht which would sail around the Gulf of Gokova in the Aegean Sea as I sunbathed on deck and drank the endless free drinks and ate delightful Turkish cuisine. 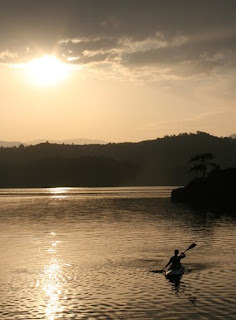 It doesn’t sound like one of my usual paddling trips but this was a padding holiday, just with a bit of a twist. The cruise was a bargain at £205 all inclusive and with two kayaks on board it just had to be done. The flight times where horrendous, hence the cheap price, so it was very early in the morning when we arrived on the deck of the Blue Cruise Gulet in Bodrum harbour. Although I was shattered I was eager to see the kayaks they’d advertised and made my way to the front of the boat. As ever with trips abroad it’s always a lottery as to the type of boat you’ll be paddling and this was no exception. The word kayak was slightly over optimistic but in all fairness these fibreglass sit on tops where ever so comfy. They had a solid high back and although they looked dreadful, they paddled easily and where incredibly stable on the water. After a good breakfast of scrambled eggs and salad and meeting the other folks we’d be spending the week with, the captain came up on deck with his charts. The plan was to sail for a couple of hours each morning then stop for lunch and get some paddling, snorkelling and swimming in before we set off again around 4pm to arrive at one of the remote bays and moor up for the evening, giving me another few hours of paddling before the sunset. There would be no portaging or packing up kit. The deckhands were there to do everything for you, from launching the boats to stowing them away at the end of each trip. All I had to do was get on and paddle, it sounded perfect. 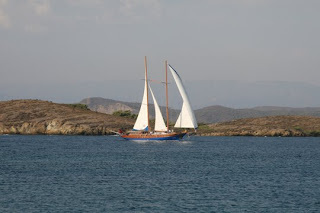 We left Bodrum at 11am and sailed 30 miles to the enchanted waters of Yedi Adalar also known as the ‘seven islands’. It was an incredibly beautiful setting as we made our way from the sea into the mouth of the bay. There were little islands dotted here and there; one could easily spend a week just exploring this tiny bit of coastline alone. I made my way to the front of the boat only to find Jean and Annette (both in their late 60’s) already with paddles in their hands. It hadn’t crossed my mind that maybe someone else would want to use the boats which in hindsight was a bit silly. Luckily though they were only on the water for 15 minutes and no one else seemed eager for a paddle so hubby and I grabbed the boats and headed off. This area is surrounded by lovely little coves and pebble beaches. The water was crystal clear and I could easily see the fish and sea urchins beneath me. We bumped into some other kayakers from another yacht all the way from Canada. This was their 3rd trip to the Aegean and they were already planning their next trip. We spent a good few hours paddling round a couple of the islands and enjoying the gorgeous sunshine. Then I totally managed to ruin my paddling reputation and my modesty in one easy step. I first botched up my exit from the kayak and ended up splashing about like a fool in the sea with an upside down boat and then to top it off (literally) I walked up the steps onto the deck totally drenched, when someone kindly pointed out that my bikini top had slipped up and I was showing a lot more than I had intended. I suppose I have to be remembered for something! By 4pm it was time to set sail again but only a mile or so into a smaller bay where we moored for the evening. We paddled ashore and took a rocky path up through a pine forest. This forest is famous for its Storax (liquidambar) a rare, endangered tree from which myrrh is extracted. I’m not sure how far this trail goes but we walked for about an hour to reach the highest point and to get the most spectacular sunset view of the little islands we’d paddled around earlier. Back on the beach there was a ‘don’t stroke the seal’ sign’, which was strange as we’d not seen any seals at all. Later that evening the captain explained that a solitary seal was living in that area and had become extremely tame and friendly. I thought this sounded wonderful and imagined how amazing it would be to swim with it. However, the seal was now causing problems for the sailors as it kept climbing into their dingies and refusing to move. I still kind of hoped he would turn up so I could jump in and have a sneaky swim, but disappointingly he didn’t show. That evening we sampled some traditional Turkish Fare. We were all given a grilled fish, complete with head and teeth, which as a veggie wasn’t very tempting so I ended up having broad beans and bread for dinner. As this was an all inclusive cruise it wasn’t long before the beer and brandy started flowing. All 12 passengers soon got to know each other very well, especially Bob who ended up sleep walking naked around the lower deck looking for the toilet at 3am, followed by Liz, his wife in her shower towel desperately trying to usher him back into their cabin. 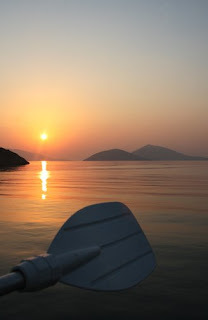 The following morning we headed off to Ballisu, 13 miles from Yedi Adalar. We were there by 11am so we had plenty of time paddling and swimming. This time I persuaded Bruce to come out in one of the boats. Even with a really bad back he paddled effortlessly around the bay, thanks to the high back design of the kayaks. We paddled along the coast and came across some cows with bells around their necks on a shingle beach, one of whom looked rather moody and started to stamp his hind leg at me as we got closer, so we decided not to land. The others were enjoying a swim and a bit of a snorkel back at the yacht. I can’t say the fish were terribly exciting to watch here but there were sea cucumbers and a fascinating car tyre with things growing off it down in the depths. Excitingly though Bruce and I came across something I’d never seen before and which made the others leap from their sunbeds to see. It was a mobile ice cream boat; the only thing missing was the music. A cornetto and calypso later and we were heading back to the yacht. That evening we moored up in one of the coves in the English Harbour, so called after the area was used as a shelter by British warships during the Second World War. This was a great place to paddle with little surprises around each headland. We paddled straight across the bay past a small statue of a mermaid and into a small port. We were on a chocolate mission and had heard there was a shop in the vicinity. It was only just over a miles paddle to reach it, but it certainly felt a lot further and challenging than if I’d been in my sea kayak. Getting in and out of the boats here was quite nerve racking too as the water around the port was filled with unusual looking blue and white jelly fish. We got our chocolate much to the delight of Liz, our token chocoholic who seemed to be able to turn any conversation back onto cakes and chocolate within seconds. We even found a restaurant and bar at this port but the sun was about to set and we had to get back to the yacht before dark. The following morning I was up at 6am. I had my early morning swim and even managed a solo paddle before the others woke up, which was so relaxing until the clouds came over and thunder filled the sky. 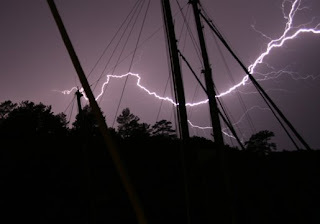 When the lightening started I got a little concerned and hurriedly paddled back to the yacht. We set sail next to Cleopatra Island 6 miles away. This island is said to have gold dust in its sand, which was shipped there by Anthony for his new bride Cleopatra for their honeymoon. You have to pay £4.50 to land and there are strict rules to abide to. Strictly no towels allowed on the beach, no smoking, everyone must shower if they’d been swimming in the water and shoes and pockets must be shook out before you leave. The Island is also home to an ancient Roman amphitheatre and is well worth a visit. Jean had a swim here and said the water felt unusually smooth and silky and when she got out her Arthritis pain in her hands and back had virtually disappeared and she could use her fingers properly again. It must be something to do with the minerals in the water but she wanted to return the next day so I’m guessing the effects didn’t last too long. The thunder storm we had that morning didn’t really clear and the Captain decided we should moor up at the port of Sogut with lots of other vessels to shelter from the storm. Wow what a storm it was. We were treated an incredible lightening show right into the night. Kaye, Dave, hubby and I took this opportunity to go to shore and discover the nightlife of Sogut. This consisted of one bar, with lots of flashing lights, a huge dance floor with disco ball, loud music and an elderly man sat in the furthest corner watching telly. We’d already had quite a few drinks on the boat so didn’t care and made full use of that dance floor. I can even remember us inventing a new dance called the ‘meercat’, probably doesn’t need much of a description and looking back I’m glad no one else was there to see. Ozer the chef off the yacht showed up for a while, he was an incredible dancer, a bit like Michael Jackson on speed, but with plenty of style. The following morning we were moving again by 7am to make the 21mile journey to Gukertme. We paddled ashore to find a quaint Turkish village complete with little old ladies spinning and weaving rugs near the beach. There wasn’t much more to see and we were soon on our way to Kargili, a cove I’ll never forget. It was just before lunch when I noticed what looked like 3 shark fins circling next to the boat, I got ever so excited. Dave, who does a lot of fishing, said they were sword fish, so excitedly I ran and got my goggles and underwater camera and waited for the captain to give the ok to dive in the water. Then it all turned into a nightmare for me. I was about to dive in when I saw the chef and deckhand whiz off in the dingy armed with a huge harpoon gun. They were in hot pursuit of the swordfish and where going to kill them in front of us all. I was distraught and apparently a few expletives left my mouth as I ran below deck almost in tears. I was sat there on my bed imagining lots of awful things that could accidentally happen with the harpoon and the deckhands bum when Hubby came down with some fantatic news. The cord had snapped on the harpoon and the deckhand had missed, so the fish got away safely and his harpoon was now lost at the bottom of the sea. That was such a perfect ending. It wasn’t long before I was back on my kayak again, which proved to be quite a strain as the wind and current had picked up considerable so I restricted myself to paddling in the bay. Later that evening two ladies from a neighbouring yacht had to be rescued by dingy as the wind and tide caught them out and they didn’t have the strength to get back to their yacht. For us it was another evening of eating and drinking and talking about good ole British grub especially puddings. We were all craving custard, cheesecake, apple pie, you name it we wanted it. The evening ended by us holding a raffle for the last 3 pieces of chocolate left on board the boat. The following day we were in Kise Buku, a snorklers paradise. The fish here were so tame, instead of swimming after them, they swam around you. I haven’t a clue what all the fish were, except some had black spots on, others had bright blue stripes and down on the bottom where huge green and orange ones. This was the first proper snorkelling I’d done and I loved it. I was soon back on the kayak though and this time I had Kaye a retired school teacher with me, who’d never paddled before, ever. She was a natural and stayed out on the water exploring the sandy coves for longer than I did that day. I don’t think it’ll be long before Dave will be buying her a sit-on-top when they get home. Our next stop was Adabogazi, a craggy bay and again fantastic for snorkelling. From the kayak I saw my first even garfish. They look like bright blue stretched out seahorses at first I thought they where eels until I saw their long pointed noses. I paddled for hours around here, meeting other kayakers from other boats along the way and swapping anecdotes from our week on the yachts. That night we had some music and limbo dancing and hubby, Bruce and Gina gave us a beautiful rendition of the Titanic theme tune sung exquisitely into wine bottle microphones. I wish we had stayed here until the end of the trip but a few people wanted to go to shore to get some shopping done so the following morning we left and ended up on Camel Beach. It sounded lovely, long golden sands with a hundred camels roaming around freely on the shore. In reality it was quite horrid. The water was full of ropes and floats so you couldn’t paddle to shore. There were jet skies thrashing about everywhere and the lovely wild camels I’d imagined, where haggard old things dressed up for the tourists to have a ride on. This stop did give me my first opportunity to try Turkish coffee though. Runny hot compost is the only way I could describe it, certainly an acquired taste. I have to admit I was quite glad to leave this beach but sadly we were now heading back to Bodrum and the end of our cruise. This holiday was definitely like no other paddling trip I’ve ever done. The purist’s will slate it but for me it was the perfect combination of sunbathing, eating, drinking, relaxing, swimming and of course loads of paddling. All my favourite things wrapped up in a single trip. Info: This would be a fantastic sea kayaking trip, with plenty of places to wild camp and explore. The locals are friendly and there are plenty of tiny villages on route to top up on food and water. Blue Cruise: I booked with Thomas Cook. Normal cruise price with nice flight times £450 for a week in October. Thanks to Onur, Ozer, Hasan and Naki for looking after us all so well. And to Kaye, Dave, Carys, Bruce, Jean, Annette, Gina, Kevin, Bob and last but not least chocoholic Liz for making each and every day so enjoyable.